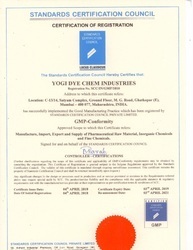 YOGI DYE CHEM INDUSTRIES, established in the year 1960 is a Manufacturer, Exporter, Wholesaler and Supplier of premium quality of organic and inorganic chemicals like Zinc Sulphate- Heptahydrate: Zn: 21 Percent, Vanadium Pentoxide, Sodium Tungstate, Cobalt Carbonate, EDTA Acid, Indole 3 Butric Acid, Aspartame Sweetener, Vitamin E - 50 Percent, Potassium Chloride LR, Copper Hydroxide, Palladium Nitrate, Micro Crystalline Cellulose (MCC) and many more. The long-term success of our organization is due its efforts for maintaining the quality features in our offerings. The offerings of our company has acclaimed worldwide for their quality standards and effectiveness. Our efforts are deemed for the provision of qualitative chemicals at relatively economical pricing and owing to this factor we have not only gained a firm hold over domestic markets but our provisions have succeeded in gaining appreciation from international markets also. We have the support of highly experienced team of employees, which has a strong impact over the growing applicability of our products. The members of our team are well versed in their concerned traits; with the result they are able to manage the affairs of the firm in a productive and most efficient manner. 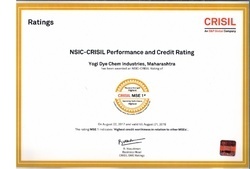 The presence of both skilled as well as semi skilled employees in our organization facilitates the manufacturing of pure and efficient range of chemical products resulting in the higher returns to our organization. Backed with state-of-art-infrastructure, our manufacturing unit is installed with all the latest machineries and advanced technologies, which are required for the manufacturing process. Our sound and technologically developed infrastructure allows us to serve our clients with the products that are effective, quality oriented and cost effective. Our widely spread infrastructure enables us to deliver the bulk orders to the customers within the scheduled time frame. For us the satisfaction of the clients matters more than any other thing related to our business. We believe in the fact that the presence of satisfied customers indicates the success of a business. Since procurement till the final delivery of product consignments, satisfaction of our clients remains the major area of concern. Our aim is to reimburse higher returns to our clients for what they pay to have the products. Our organization is backed by state-of-art-infrastructural facilities which include an advanced manufacturing unit installed with latest machines and equipments. The machines used for formulation process include power mixers, liquid mixers, vacuum pumps and many others. Moreover the manufacturing unit of our organization has the installed capacity of 50 units and is spread over the area of 5000 sq ft which results in the bulk production of consignments. 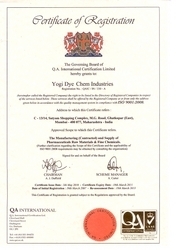 Being an ISO 9001:2008 certified company; we treat quality as the chief feature of our product consignments. We employ skilled workforce and induce scientifically advanced methods and tools for manufacturing of chemical products. Stringent quality checks are done at different levels of processing with a view to offer effective and pure range of products. Being the prominent manufacturers, Exporters, Wholesalers and Suppliers of chemicals products, we offer a wide range of products which find their application in various areas like pharmaceutical industry, textiles, petroleum, paper industries, agricultural industries, photographic films, polishing, fire proofing, paints, optical glass, hair dyes and many others. Through the course of time, we have been able to understand & respond to the varied needs of our clients. Our expertise comes from the long experience that we have in the industry and the advanced technologies that we employ in our facilities. Here are some of the immediate reasons that have made us a trusted manufacturer and supplier of organic and inorganic chemicals. Innovative and focused approach have made us one of the forerunners in the market. We have built up our expertise responding to diverse customer requirements through the quality of the products and strong distribution network. Efficient teamwork & strong associations have guided us to success. Our organization is being served by a team of skilled, semi skilled, research and development, chemical engineers and other personnel. This ensures effective performance at all levels of working. Our employees possess a vast experience of their concerned area owing to which they are able to cope up with the requisites of their concerned area their bringing efficiency into their business conduct. CNF agents and many others. Being the leading chemical manufacturing firm we not only serve the domestic market but our offerings are equally demanded in various international markets. 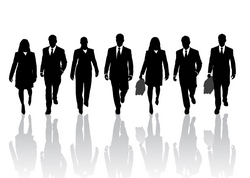 We cater to a number of clients both from domestic as well as from commercial sectors. Large number of industries makes use of our chemical products for formulating different types of drugs.